I have been using another telecommunication network for over a decade and even if there are a number of telecommunication lines with various promotions, my loyalty is all glued to this network. But, when budget becomes a pressing issue, my need for a more value - laden communication service becomes more persistent and adamant. So, a visit to a local Sun Cellular Shop made me realized what I have been wasting on my old telecommunication line. With unlimited texts to other Sun numbers with free hours of call and 500 free texts to other networks for as low as 250.00 among other freebies, what more can I ask for. And, to have the same privileges enjoyed by family members through a group plan, Sun Cellular has become and shall be a personal household name. And, Sun Cellular doesn't hold its leash tighter on services as it launches its new baby and the entire Filipinos have better reason to shift to Sun. Read on this official press release from the desk of Sun Cellular Senior Manager for Digital Marketing James Lim. 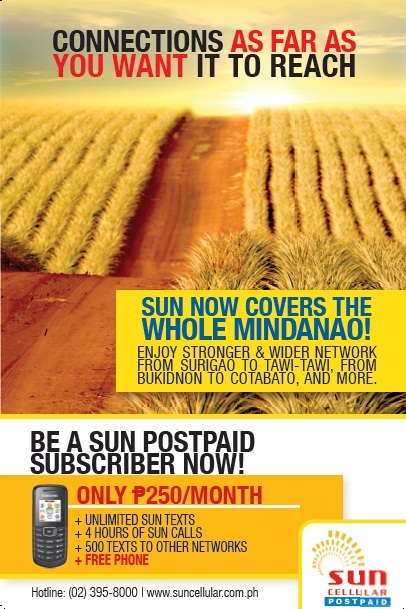 Following its intensified network expansion program, Sun Cellular launched its first salvo of new and better value postpaid plans, the Postpaid Plan 250 initially available in Mindanao. “Given the immense demand for Sun Cellular’s best-value services in Mindanao, we have specifically chosen the region as our pilot area for this subscription plan offering,” says Ricky Pena, Senior Vice President for Postpaid and New Business. 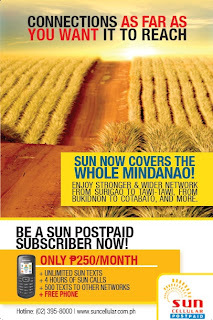 For only Php250.00 per month, subscribers to this new postpaid plan includes unlimited Sun-to-Sun texts, four hours of Sun-to-Sun calls, 500 texts to other networks plus a free Samsung E1080 phone. This plan is perfect for those who want to enjoy unlimited texting and still be able to call their friends and loved ones from time to time. Also with the generous allocation of texts to other networks, this plan will also attract those who want to stay in touch but do not want to spend too much. 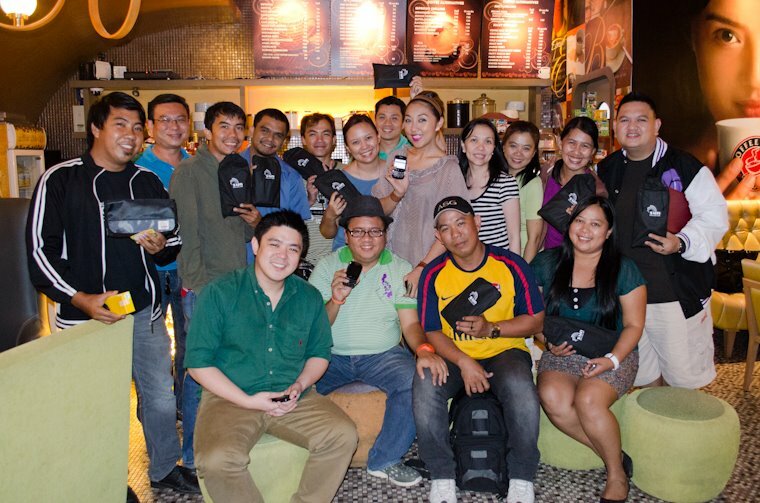 Sun Cellular has been the preferred choice of over 50% of new postpaid plan subscribers for the past 5 years. Its postpaid subscriber base continues to grow steadily increasing by more than 30% year over year in January of 2012 versus the same period last year. “This 2012, we are focusing on boosting our network signal strength by augmenting and optimizing our existing cell sites, and taking advantage of synergies with our sister companies in the PLDT Group. Our extensive network strengthening campaign will be complimented with products that best suit the needs of the locals in the areas we are expanding to,” Pena revealed. The first wave of these network enhancement efforts are now being felt in the areas of Lanao del Norte and Lanao del Sur, Basilan, Camiguin, Zamboanga, Tawi-Tawi, Dinagat Island, Compostella Valley, Sulu, Bukidnon, Cagayan de Oro, Davao del Sur, among others. Sun Cellular is a member of the PLDT Group.